2 Track Inbound Links: How Do People Get to Your Website? If you have access to the code on your website and are comfortable with basic HTML, getting started with Google Analytics is relatively easy. What's less easy is getting used to the sheer mass of data in Google Analytics. What should you be looking at, and how do you move from data collection to actions that will improve your business? Track Inbound Links: How Do People Get to Your Website? It’s important to know where your website traffic is coming from. If you can identify which ads and other links from outside websites are bringing people to your site, you can focus on creating more of these productive inbound links. Let’s say your company gets a lot of its sales from people who visit your website, even if you aren’t actually selling products on the site. If you track the percentage of new visitors to your site that have arrived there by clicking on a PPC (pay-per-click) ad, versus those who arrive at your site from search engine results, you’ll have data to help you decide whether PPC is a better investment for your company than trying to drive your website to the top 10 search results. Google Analytics automatically categorizes traffic from inbound links, but the categories assigned may not be useful to you. Fortunately, you can create custom tags for any links that your company controls. If you manually tag specific links, you’ll be able to do a better job of measuring traffic coming in from marketing efforts such as email, PPC ads and social media campaigns. In Google AdWords, go to My Account > Preferences. Ensure that Auto-tagging has been enabled. Now your Google AdWords traffic will be properly tagged within your Google Analytics reports. You’ll be able to get reports on the performance of specific campaigns, and how your ad text is performing – information that will help you make decisions about your future ad campaigns. You should create a custom tag for any paid links you have with companies other than Google -- for example, Bing. If you don’t create these tags, PPC traffic from other search engines will be identified as ordinary search engine traffic, skewing your data for true organic search traffic. Without custom tags, traffic from emails and social media sites will be labeled as “referral” traffic, further muddying the feedback on your marketing efforts. 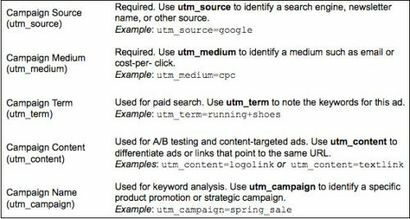 To track and classify non-AdWords traffic, you need to add UTM parameter tags. For example, the tag “utm_medium=cpc” should be added to the URLs of your PPC ads that aren't with Google. The “cpc” part of this tag stands for “cost per click,” a term that’s used in the Internet ad world to refer to the advertiser’s cost – or payment – every time someone clicks on an ad. UTM parameter tags can be used for other purposes, too. They can identify a specific ad campaign, a keyword or other elements of a marketing campaign that you might want to track. UTM parameter links allow you to view traffic data segmented by your assigned parameters in your analytics reports. This level of detail gives you better - and more actionable - information about just how effective each marketing effort really is. For an e-commerce site, leads could include sales. For a business-to-business website, you might want to look at how many people sign up for your newsletter, how many download your white papers, or how many sign up for the free trial of your software. If you measure your online leads both as a total figure and by individual sources of traffic, you’ll be able to determine which marketing campaigns are providing the most valuable leads. Online ad campaigns, social media and email campaigns can all be cost-effective ways of bringing new visitors to your site and building awareness of your brand. Tracking how new visitors get to your site will help you determine which tactics are the most effective, and which provide the best return on investment. For some sites, repeat visitors are even more valuable than new ones. E-commerce sites tend to see higher average orders from their repeat visitors, while online publications rely on repeat visitor numbers to set their advertising rates. Watching your data over time – and observing the trends – will help you learn which marketing efforts are yielding the best results, and which deserve the most investment. Get Anvil Media Inc.'s complete search marketer's guide Google Analytics by filling out the form on Anvil Media's website.